New UNIQLO store is underway! This is good news to all fashionistas out there who imply love Uniqlo clothing. I bet, you saw this same wall a few months before the June opening of UNIQLO, Japan’s No. 1 Fashion Brand, at the SM Mall of Asia. Now let's play some guessing game. Where is this new one located? Block off your calendars and go North one of these days to have an idea. UNIQLO opened its first store in the Philippines last June 15 in SM Mall of Asia, one of the largest shopping malls in the world, occupying a waterfront site on Manila Bay spanning 407,000 square meters. This massive shopping complex hosts a wide range of retail tenants, including a number of major fashion brands, and is a major draw for both tourists and local residents. 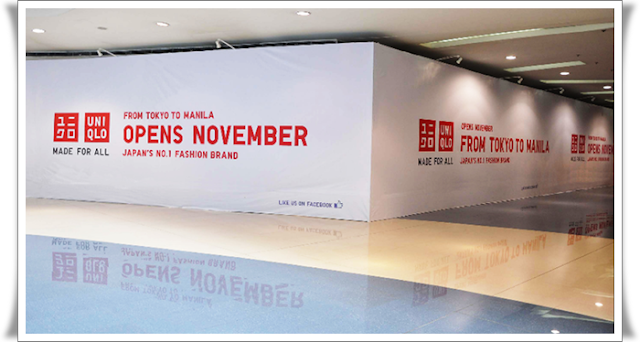 The new UNIQLO Mall of Asia Store will be one of SM Mall of Asia’s largest tenants. We will be releasing the latest information and regular updates through the following sites. So please “Like” www.facebook.com/uniqlo.ph and visit www.uniqlo.com/ph.